"I took this course in preparation for the Q Certification. It was super informative and eye opening in regard to grading objectively. I would highly suggest this course to anyone looking to better their cupping skills!" -Mike Ward, Quality Control & Online Manager, Rook Coffee. This advanced cupping workshop is geared towards roasters and baristas with some previous cupping experience. Going beyond cupping protocol, we'll dive deeper into describing coffees, using the SCA Cupping Form* to evaluate and grade them objectively. Many roasters and baristas are not able to taste a wide range of coffees in their day to day operations. This is a great opportunity to cup 12 coffees of varying origins, processing techniques and quality levels to see the wide range specialty coffee can have in terms of scoring, and to see how cupping forms are designed to help you score without bias. It's also just a great workshop for palate development! Please click here to register and feel free to email Education@royalny.com with any questions about this class. *If you have never used the SCA Form before, fear not! We will have our RNY custom cupping forms on hand. The RNY form is an abridged version of the SCA form and is good practice for beginners. ** Some previous cupping experience required. 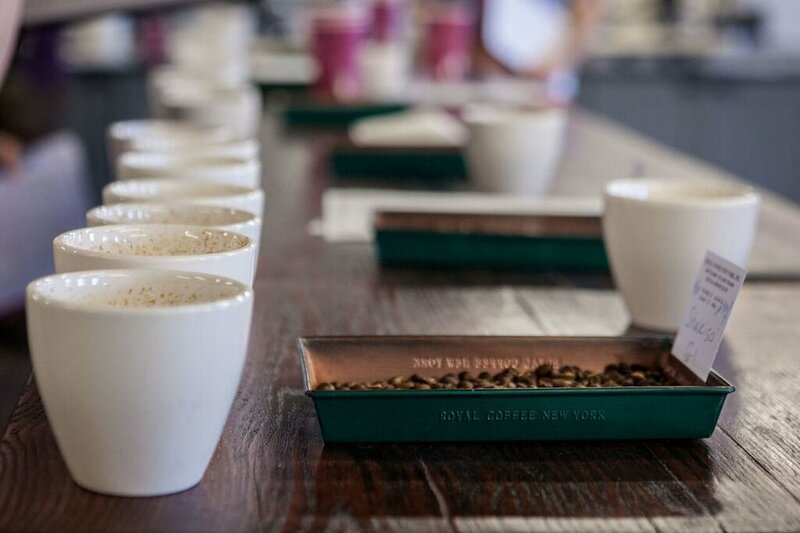 If you have never cupped before, please check out our Introduction to Coffee Tasting class.